So these two were right after Xmas and Disneyworld weeks so right after three weeks of relative gluttony and excess and certainly too much beer and cheese and not enough running. 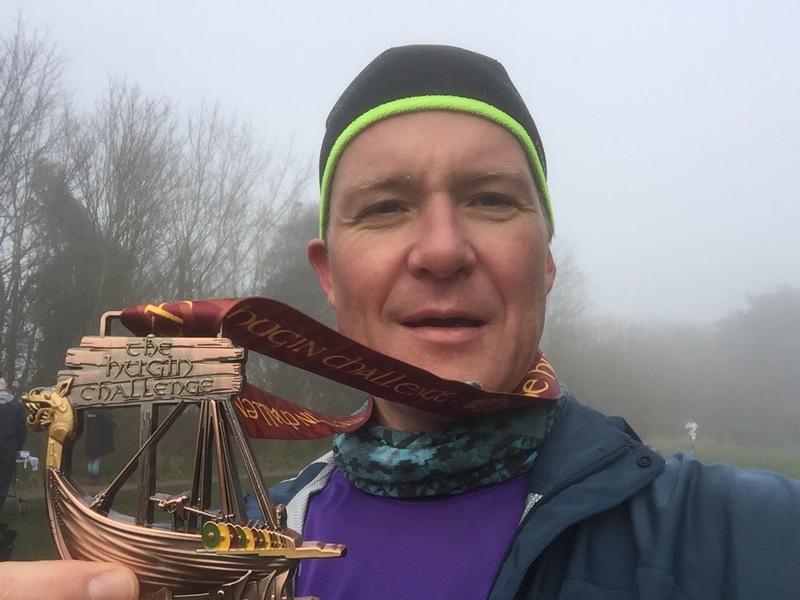 I know I did marathons on New Year’s Eve and New Year’s Day and the Disney early Jan but that’s not consistent training – that’s just running off my previous training and coasting it. These two were the weekend after I landed from Disney so I’d had not day off and no time to catch up on my sleep/ training. This sounds like I’m warming you all up for massive failure but I’m not, I’m just putting the runs into their correct context. I still know I have NO EXCUSE for not posting these reports sooner and it’s only the impending FOUR I’m running this weekend and early next week that’s making me finish it now. I will now solemnly promise to write my run reports no later than 7 days after as I’m going for 52 marathons in 52 weeks this year I have some writing to do! 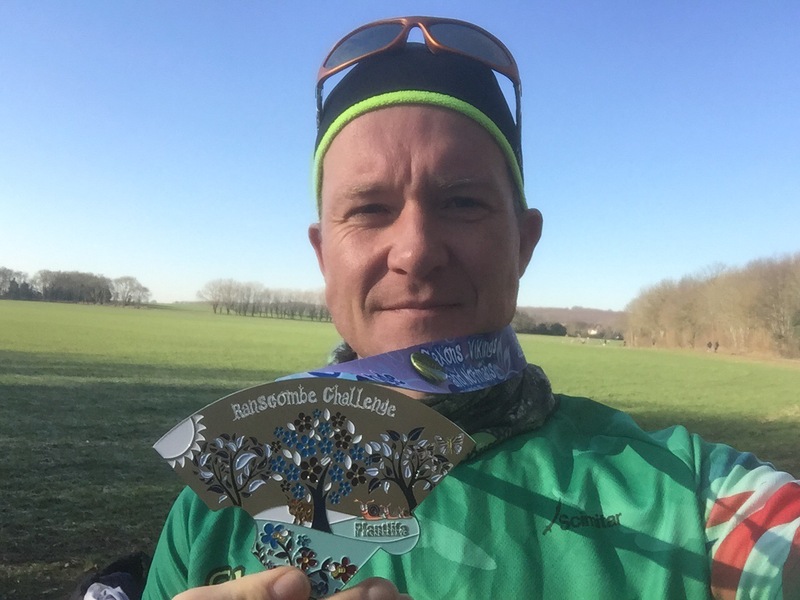 Anyway Ranscombe Farm is my favourite place to do a marathon. It’s hilly, muddy, woody and gorgeous with huge panoramic views and gorgeous sunrises and sunsets so I was looking forward to this a lot. I don’t have any pictures of the views because my iPhone 6 Plus is SO HUGE I don’t tend to run with it and I like the purity of running without stopping to take pictures every 5 minutes, I like to record the beauty in my mind- sometimes I forget and that’s what makes me go back to re-mind myself how beautiful our countryside is. So it was dark when I arrived and though we were warned NOT to park on the grass car park unless you had four wheel drive, I had a go and had to position my car so that if the icy ground thawed I could roll out of the car park unscathed. Picked up my bib (in the dark) and went back to my car to read my book for a while as I was 1.5 hours early. I like being early so I can park! It was freezing outside and the ground was rock solid and did not look to be thawing out soon. Half hour to go I got up and I started mingling with the usual suspects getting to know what everyone had been doing over Xmas that I had not seen on Facebook recently. Brief race brief and congratulations for Amanda Bashford on her 100th Marathon this day and we were off. I was aiming on taking it nice and easy as I had the Hugin Marathon the day after so I thought I would soak up the freezing landscape and enjoy myself. My hands were nice and snugly warm in my new Nike Thermal gloves my wife had bought me for Xmas. They even have edges on the fingers so I can use my iPhone with them on. Love them. Desperate measures meant green jelly babies and some Lucozade Sport were in order and I soon came round for the last few laps. To make things more fun the ground was starting to defrost but only the top muddy layer not the frozen solid bottom layer hence on my penultimate lap (of 7) I ended up pirouetting at the bottom of a steep decline left and right and up and down trying NOT to fall on my arse and injure myself but having a hard time with soft mud on hard compacted ice-mud. I stayed upright but sure I gave some people a laugh on the way. Knowing I was near the end and keeping some energy for tomorrow I slip slided my way through the last two laps for a 4:47 with 3173ft of elevation for my sins. 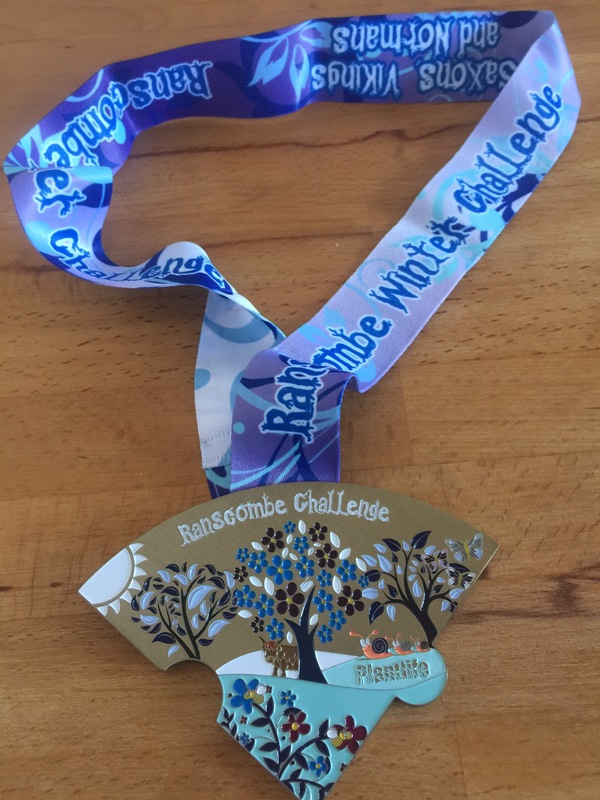 And a lovely medal- first of 4 new designs all meant to jigsaw together at the end of the year. 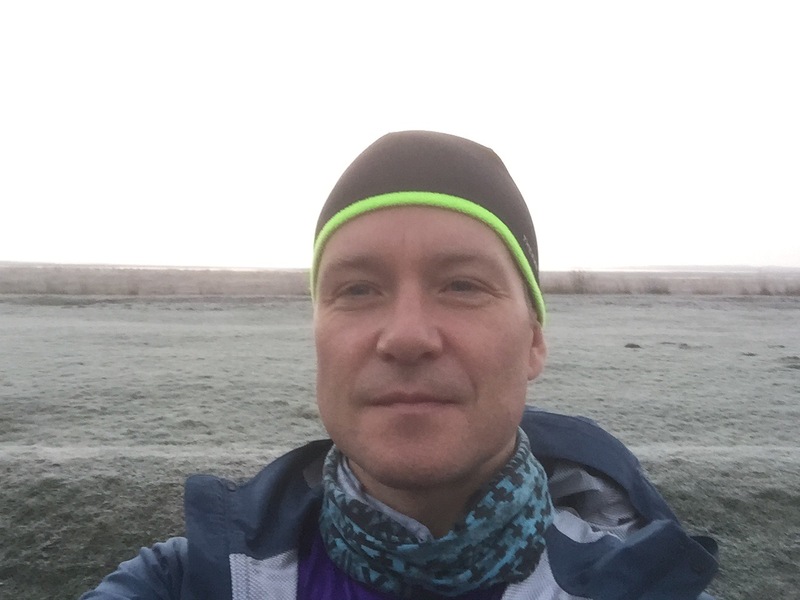 This was marathon number 43 and on the way the car said the outside temperature was -5 degrees and it felt like it! Knowing it was freezing I had dressed accordingly with thermal hat and gloves and my new ace Uniglo undervest that I got free at the Disney Marathon. Now this is a great run as it’s fairly flat and you get to pass a Viking ship every lap. It’s 8 laps for marathon and the run is two thirds trail and the rest pavement with very little elevation. A good time for a fast run I thought. Sat in the car I saw it was 8:30 so I got out ready to mingle and say hello to everyone until the race briefing at 10 to 9. No. The race started at 9:30 so I had left the relative warmth of my car for the -5 degrees outside for an hour as once out I got talking and thought I’d be fine. Eventually, and not a minute too soon, race briefing started and we were off. It’s a thin track for the first mile or so and I was happy to slot in behind everyone and keep an easy warm up pace so I could (literally) warm up! Unfortunately my beautiful new gloves were no use today as I could not feel three fingers on each hand (little one and next two) as well as having little feeling in my little toes and their neighbours. Everyone seemed to be in the same boat (not the Viking one) and I think it took me the whole first lap to actually feel my fingers and half way through the second to feel all my toes! 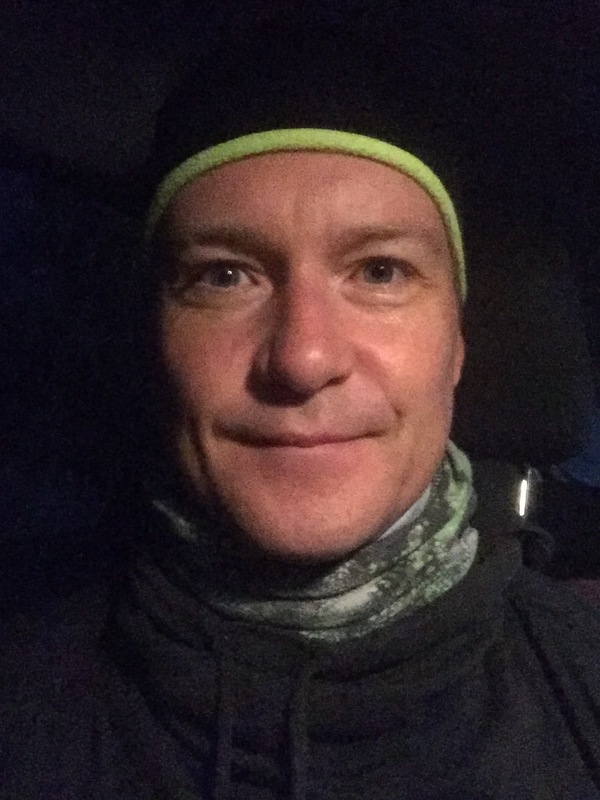 Now I was feeling warmer I gathered my thoughts and started to think about pace and finishing times. At my current pace I would have had to buck my ideas up for a sub 4 but I gave it a try even though my quads were definitely feeling yesterday’s elevation. As you can see around half way I started slowing down and this was for two reasons. 1: A mist of biblical proportions had descended about half hour before and it had deposited moisture on my eyelashes that froze. Yes my eyelashes froze! Other people had frozen hair where the mist had descended and just plain froze on the spot. This wasn’t helping matters on the sub four front. 2: My legs hurt. Basically I’d spent just under 5 hours yesterday running up and down trails and my legs were battered through under training and overuse! So I made a brilliant decision and worked out in my head if I relaxed and started to enjoy myself in the cold, I could get sub 4:15. Plan B was hatched. Legs were hurting, frozen eye lashes and still 10 miles to go but I’d changed my nutrition to Tailwind and it was working wonders on my energy. I had lots of energy but no legs to follow it through but this was fine as I knew Relentless Forward Motion would get me through. Around mile 18 onward I got a huge need for salty crisps so basically grabbed huge handfuls for a few laps and this seemed to satiate my crisp fetish! All was good and I moved on. ﻿As I came into the final 100 metres I saw I was close to my goal so got a spurt on and made it. Sub 4:15 result. Job done again with a beauty of a medal too. Straight in the car with the heaters on full and heated seats was heaven! Since then I’ve been training well, getting in around 50 miles each the last few weeks and doing lots of hills and trails so I’m feeling good for my four in four starting this Saturday. I’ve completely revised my nutrition so it will be interesting to see how it affects my running and recovery. 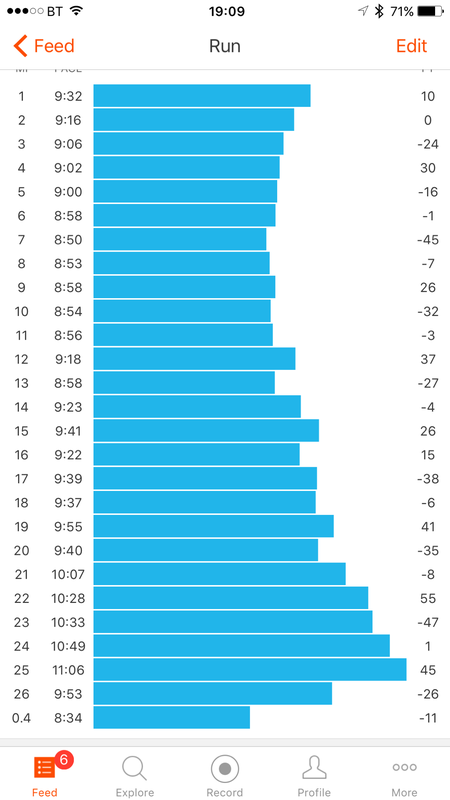 Not drinking beer and hard training gave me a PB twice last week running into work (6.5 miles). I’ve been working long hours since Monday this week so have not run once yet which is good rest for my legs. I’m aiming for an hour slow run tomorrow night and that’s it. For my food I’m introducing sweet potato and beetroot for the next two days as an attempt to top my carb levels up and I’ll continue this over the four day and eat well to see if it helps recovery and racing. A new thing I’m adding is right after the race I’m not digging into the goody bag and eating crisps and chocolate as usual but I’m bringing a cool bag with me that will have a large avocado, 2 boiled eggs, 200g of roasted sweet potato chips and 100g of beetroot chips all washed down with cold Rooibis tea. Let’s see if it works. I’ve worked out the nutrient macros and it should work but the only way to see is try it. Another big change I’ve done is my race fuel, I’m going back to homemade bars of dates, crushed almonds, chia seeds, cocoa powder and orange extract for delicious 120 calorie bars that I can snack every half hour (after an hour) which should give my about 50g carbs per hour with a little protein and fats. I’ll document this prep on Friday night and let’s see if it works. I will be taking some Clif bars just in case of course.